Tooth decay can damage the structure and function of your tooth, especially if it isn’t treated immediately. A dental crown protects the sensitive part of the tooth by removing decay and replacing the natural tooth with a cap that resembles your natural tooth. Crowns are a step up from composite fillings, which can only provide so much reinforcement before there’s not enough tooth left. Support a tooth that has lost its structure. Add stability to either side of a dental bridge. Attach to a dental implant. Replace a filling if tooth decay has spread. Our practice places crowns for Monrovia patients using digital imaging to detect the extent of damage to the tooth as well as Cariview, a small camera to evaluate the beginning of decay in your other teeth. Dr. Q strives for results to be as natural as possible. She uses only zirconia and gold for crowns which are long lasting and do not compromise safety. Other dentists still use silver, which is about 90% mercury and can further damage your teeth because they expand and contract as the temperature changes. Anesthesia to numb the treatment area. Taking an impression of your tooth to ensure the proper fit. Matching the shade of your crown to your natural teeth. Removing existing decay to prevent it from spreading. Placing the temporary crown while your permanent crown is made. You will be able to eat normally with your temporary crown once the anesthesia wears off. The permanent crown typically takes one to two weeks to create, and you’ll need to come in for a follow-up appointment to switch out the temporary for the permanent. Nitrous oxide is inhaled through a mask placed over your nose and takes effect immediately. The flow of nitrous oxide and oxygen can be adjusted based on how you feel and the effects wear off five minutes after treatment. Oral sedation involves taking a pill an hour before your procedure. Once the pill has kicked in, you will be awake but may doze off occasionally. If you choose this option, you’ll need someone to drive you home after your crown is placed. Sedation is an option that we offer to relieve dental anxiety, which we understand is very common in dental patients. We know that a visit to the dentist can be challenging for many Monrovia patients and we will do everything we can to make you feel comfortable and relaxed. A crown is placed to protect your tooth, but it needs to be cared for the same way you do a natural tooth. For patients who have never had a crown before, it can feel strange for the first week until you get used to the feeling. Dr. Q may even need to reshape the crown to provide you with a better fit if you feel it is uncomfortable. Dental crowns are created to endure the same force of biting and chewing as normal teeth do. Like your natural teeth, a crown is susceptible to the same problems and may require additional work if you don’t care for it properly. Dr. Q has practiced cosmetic and general dentistry in the Monrovia area for over ten years. In that time, she has assembled dedicated staff members and specialists to treat a wide variety of conditions. 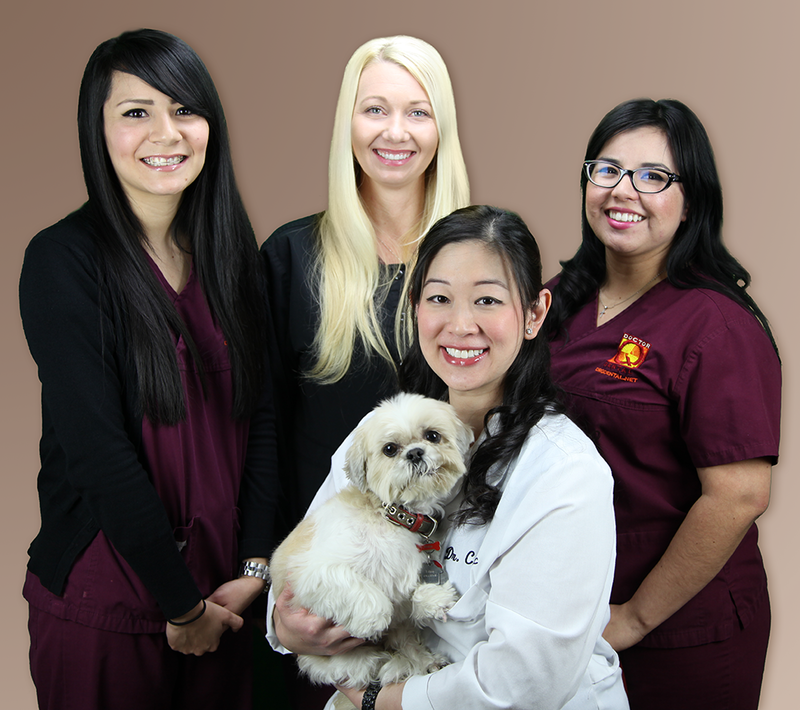 Her practice features digital imaging and advanced diagnostic and treatment options to enhance patient comfort. When you become a patient of Dr. Q Dental, you are treated like family. If you’re in need of a crown, please contact our office in the Monrovia area today at (626) 599-9819.